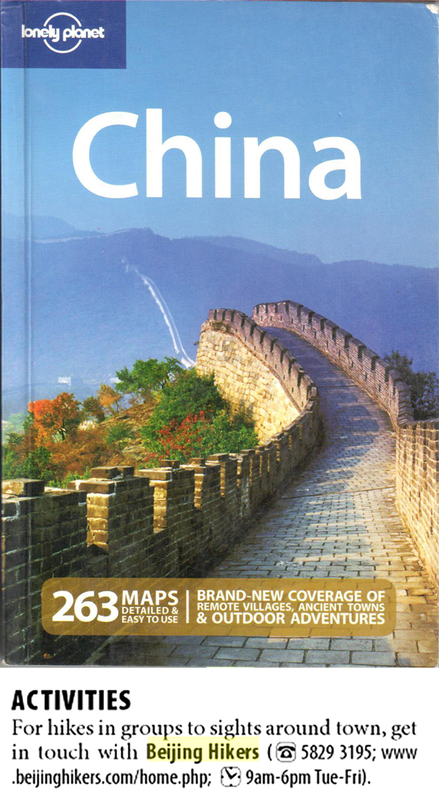 In Brief: Beijing Hikers was listed in the Beijing activities section of Lonely Planet China, 2009. Lonely Planet said to "get in touch with Beijing Hikers" for activities in Beijing. We agree! Thanks, Lonely Planet! UPDATE 2014: This was a long time ago, but you can still get in touch with us! Our website address is the same, but the phone numbers have changed. For best results via phone please call the new office number (+86 10 6432-2786) instead of the old office number or mobile phone listed.